This past weekend was the delightful combination of Strasbourg, the Forêt Noire, Germany, and a tour of a family run vinyard. These excursions are built into my program, and they're always quite enjoyable. Alsace is a small region of france, but it is densely populated. Throughout history, there have been wars, political decisions, and other such factors that have effected the owning country of the region. It used to be German for many years, then French again, then German again, then French. It's all quite complicated. Because of this, the people of Alsace speak Alsatian and French. 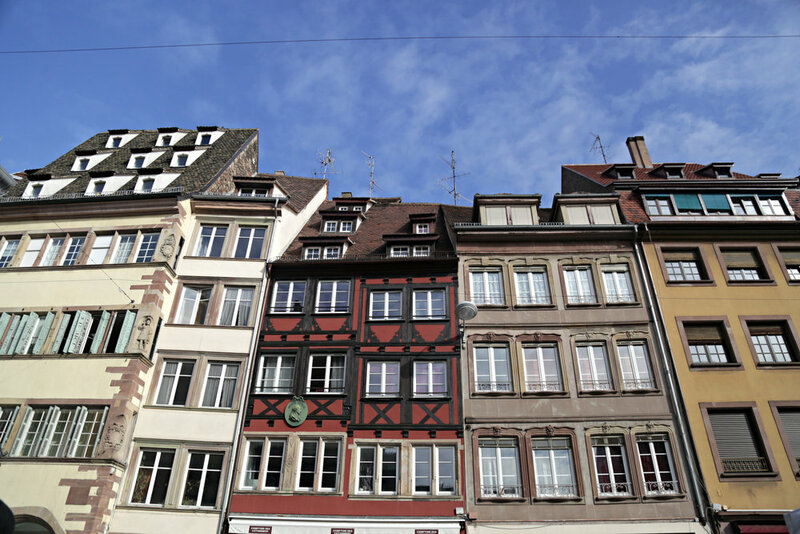 Strasbourg is the home of many European institutions. The Council of Europe, including the European Court of Human Rights, meets here, in the heart of Europe. The quiet city centre is a UNESCO World Heritage site, but that's almost old news in Europe. It almost seems that anything worth its salt is a UNESCO World Heritage site in Europe these days. The streets of Petit France, their most touristy quarter, were beautiful. I love the canals of the cities I've been fortunate enough to visit. They're so calm and romantic. This canal had locks. Ohhhh, fancy. The square was pale, lovely, and so calm. What a great little introduction to the day. The Münster Cathedral had services since we were there Sunday morning. Some of the group went into the church, but I felt like I couldn't just pop in for 6 minutes or so. They used to pattern the sidewalks based on what the shops would sell. So you can see that this shop sold shoes (and still does!). It was used in large part to assist the public since most of them couldn't read. And then we traveled to the Black Forest and Lake Titisee. That'll be up on the blog next!